Check back next week to see our picks for week four, and how the players performed that we picked the week prior. See the bottom of this article for details. Alderson is coming off of a huge junior campaign where he passed for 2,133 yards and 23 touchdowns against only four interceptions. He also scored 11 touchdowns rushing a season ago. Thus far this season, Kyler has passed for 397 total yards and thrown four touchdowns in each of the Red Raiders first two games. Alderson has also added 115 yards and three scores on the ground and is a key reason Wamego is a top five team in 4A-II. 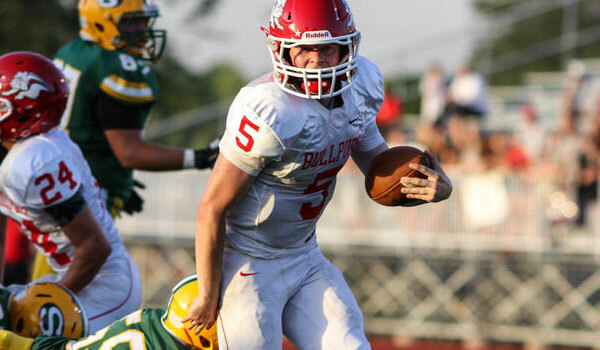 Look for Alderson and the Red Raiders to pick up another win against Marysville this week. Through his first two games of his junior season, Becker (6-2, 158) already has 10 catches for 309 yards and five touchdowns. He has quickly become the favorite target for Salina South quarterback Dalton Wassenberg, accounting for than 50 percent of his completions thus far. The Cougars (2-0) will look to Becker often in a big game at Hutchinson. The Panthers have racked up 484.5 rushing yards per game and 14 rushing touchdowns over the first two weeks of the season. Division-one recruit and two-time all-state selection, Joey Ferron, anchors the offensive line for the Panther backfield that features running back Darrian Turner (196.0 yards per game) and quarterback Wyatt Vandorn (151.5 yards per game). Many expected a drop off with the loss of several key players to graduation and a move up to class 3A this season, but the ball is still rolling in Centralia. The Bullpups have started the season 0-2 against stiff competition in Salina South and Andale, and Kinnamon has struggled as the primary target of opposing defenses. Kinnamon had a strong rushing effort in week one against South with 94 yards and two touchdowns on 13 carries, but was also picked off four times. Last week, Andale held him to just 10 yards rushing on 11 carries and forced his fifth interception of the season. Kinnamon and his teammates will be hungry to break into the win column this week against a much improved Augusta team that is 1-1 under first year coach Jason Filbeck, and while the Orioles will likely be no pushover, the Bullpups should get into the win column behind a breakout game by Kinnamon. The Tigers signal caller was a true dual threat QB in the big win over Blue Valley West as he ran and passed for over 100 yards and scored on the ground and through the air. McCumber has rushed for 182 yards and passed for 242 yards already this season. Blue Valley will need a similar performance from him this week as the Tigers take on another high-flying offense in Bishop Miege. The hype is starting to grow for Norton freshman quarterback Jace Ruder, who has completed 17 of 24 passes for 356 yards with a 5/0 TD/INT ratio in two impressive wins against Ellis and rival Phillipsburg. Ruder spent time at an elite quarterback camp in California this summer and dunked as an eighth grader on the basketball court. Ruder has helped Norton defeat Ellis 46-0 and Phillipsburg 34-7. This week, the Bluejays travel to Oakley in a key MCL contest. Oakley, the No. 1 scoring defense in all of Kansas last season, struggled last week in a 35-8 loss at Smith Center.